The fabled Boston Marathon has many unique features, twists, and turns that make it one of the most spectacular and special marathons in the world. From the famous start in the inconspicuous town of Hopkinton to the fabled hills of Newtown to the prestige of a marathon that you have to qualify for – Boston is special. Perhaps the most interesting twist at the Boston Marathon is the late start time. Almost all other marathons begin early in the morning before most “normal” people are out of bed; however, the Boston Marathon starts at 10am or later, depending on your corral seeding. While this late start time is great for spectators, it can create quite a bit of confusion for runners accustomed to racing early in the morning, especially when it involves to what to eat before the race. Planning your pre race marathon meal is a critical logistic you must get right to have a successful race. With the Boston Marathon not starting until past 10am, how do you adjust your pre race fueling strategy? Because the Boston Marathon starts later in the morning, you should get a more substantial breakfast than your normal marathon routine. Many runners simply consume a gel or an energy bar before the start of most early marathons because they’re only awake for a couple of hours before the gun goes off or because they have a weak stomach. With a 10am start time, a simple gel won’t be enough. If you’ve been experimenting with your pre race marathon nutrition, you should have a pretty good idea of what type of foods work with your stomach when running hard and how long before running you can eat them. Therefore, on race morning, you should wake-up at 6 or 7am and consume a substantial breakfast that will sit well in your stomach and provide the fuel you need. This will ensure that you have ample time to digest what you eat and let the food settle. Meanwhile, a meal that is more than simple sugars will help you maximize your glycogen stores without overdosing on simple sugars. Whatever you decide to use for Boston this year, make sure you practice with it in training. DO NOT TRY ANYTING NEW ON RACE DAY. Try eating your proposed breakfast three or four hours before your last long run or hard workout and make sure it sits well in your stomach. Yes, this might mean you have to wake up at an ungodly hour (or push your run back to 10am, which is good practice in itself) but it’s worth it to ensure you have a great race. Yes, it’s a lot, but I have a strong stomach and I practice with this meal countless times throughout my training. 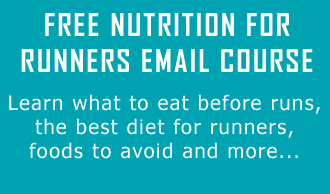 Find your optimal meal over the next few weeks and hit race day confident in your nutrition plan! If you’re running Boston this year, or you’ve run in the past, tell us what you ate before the race and how it worked for you. We would love to hear some more suggestions. As always, we’ll be here to answer any questions you have, so answer ask away! Great to read anything on Boston right now Jeff. Last time I ran Boston was in ’98 and then we started at noon. We sat out in the school yard forever and I’m sure I didn’t do a good job of eating. A few years ago I started eating whole wheat pancakes, a banana and a glass of orange juice 4 hours before a marathon. I really felt the difference in performance than the power bar I had been eating at race start. For my long runs and the races I’ve recently ran, I’ve had my pancakes 3-4 hours before. It is a challenge when you’re out of town making sure I can get them at the hotel that early. I usually put them in the fridge the day before and microwave them in the morning. Since my bus schedule leaves at 6:00, I plan on eating right before I get on the bus and with the 10:00 start time, I should be good. This Year i had breakfast around 5:15am, so i could get to the buses early enough. It was my standard pre race favorite, Oatmeal made with full milk, a banana sliced up and a hand full of walnut chunks mixed in, then a good drizzle of honey. At the school about an hour before my start i had one of those medium protein content power bars, while lying down in the shade. During the race it was a gel every 10k starting from Km 5. Im sure my fueling helped me to a good PB despite the outrageous heat.